Looking at history on the face of it some of them seemed to have very little to be thankful. Many lost friends and family on the journey and even more didn't make it through the winter, but they remained thankful to God on their journey in spite of the hard times. Maybe they had stoked up on board for the up coming Christmas as the Thanksgiving meal looks very like the Christmas dinner - Turkey and all. At my first Thanksgiving meal we experienced it by purchasing Dinner in a box from the local supermarket with everything from a Turkey to cranberry's. 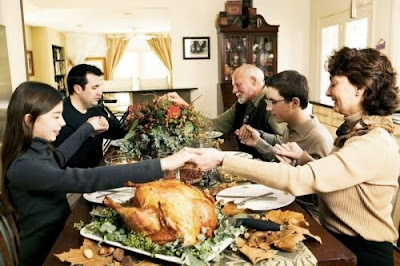 I wish all my American friends a happy Thanksgiving day. Enjoy the day, dinner and oh yes the football. Then stay away from the crazy black Friday Thanksgiving sales.